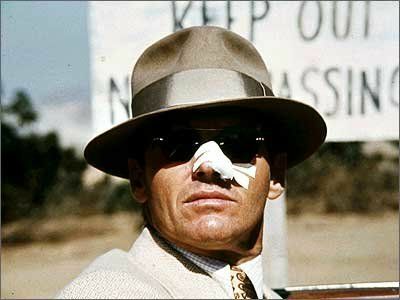 Ranked 21 on AFI’s Top 100 films, Roman Polanski’s Chinatown opens with credits that suggest the romanticism of Rebecca, but what follows is a more cynical noir that reveals a pre-war Los Angeles rotten to its core. Private investigator Jake Giddes (Jack Nicholson) becomes embroiled in a snoop case that appears to be standard infidelity but the job embroils him in discovery of political corruption and sexual depravity. His client, Faye Dunaway, is hiding a horrible family secret that involves her titan of a father, John Huston. Giddes carries scars of his own, stemming from his time in the police force working Chinatown. Polanski’s film is meticulously shot, presenting a classic LA that is mesmerizing and foreboding. Robert Towne’s script is taut and engrossing. Still, this is an overpraised film. Towne chooses to keep the demons of Giddes’ past a secret, which is ultimately unsatisfying, given how critical he is to the story. Moreover, the love affair between Nicholson and Dunaway is unconvincing, mainly because Nicholson is giving a modern performance, whereas Dunaway is mannered and breathlessly dramatic, as if they were working separate material. Nicholson is updating the tough talk of Sam Spade while Dunaway is embracing the older form. When Nicholson puts himself on the line for her, the act seems forced and inauthentic, and the closing line has the faint whiff of the Gouda. A fine film but certainly not the 21st best picture of all time.